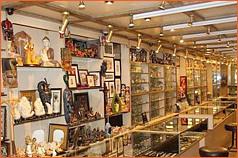 The Amber store is India’s leading destination online for a variety of Indian Art, Handicrafts and Jewellery. The store is renowned for a collection of Wooden Artware, Brassware, Marbleware, Paintings, Gemstone Artware, Pashminas, Scarves and a host of curios and gift articles. The store was established in the year 1970 and it’s been almost 4 decades since they are in the business. Our mission has always been to work with village-based artisans across India employing their regional artistic skills and specialities. This commitment has helped preserve the traditional crafts of India and created employment opportunities in rural areas. At Amber, we attempt to maximize the handmade process, using hand-woven, handblock-printed fabrics and vegetable dyes as far as possible. In case of artefacts too, general procedure is in using hand tools with eco-friendly chemicals & materials. The handcrafted process and techniques of production gives the artefacts a unique character. In addition, rural employment is generated & traditional art & skill is preserved and appreciated. 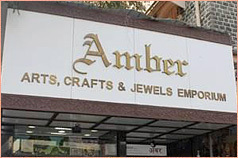 Amber is a registered firm in India. The store is solicited by Corporates, Missionaries, Airlines, Consulates, NRIs, Foreigners, Banks and the finest of Elite society. This outlet is managed by Mr. Mahesh L. Bathija, who speaks and understands multiple foreign languages and has sustained the family tradition and philosophy of practicing fair business ethics with complete customer satisfaction. The management believes in providing to its customers, goods of best quality at reasonable prices and services of the highest order. We offer online sales through our website to different countries like Australia, Belgium, Canada, Denmark, England, France, Germany, Greece, HK, Holland, Indonesia, Italy, Japan, Malaysia, Mauritius, Mexico, New Zealand, Northern Ireland, Philippines, Portugal, Scotland, Singapore, Spain, Sri Lanka, Sweden, Switzerland, Taiwan, Thailand, USA & UAE.